From the start, we knew that to change public opinion on the war, we would need to engage in bold, attention-getting actions that could push the issues onto the front page — like dropping giant pink slips, creating massive aerial images, or getting arrested for justice. We've learned that the most amazing things happen when we push past our fear. We've learned it's important to get inside, whether we're in a congressional hearing or staging citizens' arrests during expensive fundraisers. This year, witnessing the most expensive election in US history, we disrupted the Republican and Democratic Conventions nearly nightly. We staged Occupy AIPAC to protest against war on Iran at the conference of one of the most influential right-wing lobby groups in the US. We hand-delivered our Peace with Iran petition to both Michelle and Barack Obama. And our glittering of candidate Tim Pawlenty was covered in TIME magazine! Whether we are going to Iraq before the US invasion, delivering medical aid to Gaza immediately after Israeli bombing, or standing with Occupy Wall Street from day one, we are often one of the first progressive groups on the ground to be a voice for change. Witnessing the shift in warfare to using robotic planes, this year we hosted the first-ever international drone summit in Washington, DC, staged protests outside of drone bases and at the NATO summit, led a delegation to Pakistan, and coordinated Medea Benjamin's national book tour. We'll be at the inauguration in January, 2013, as we don't want to waste any time holding President Obama accountable to the desires of the American voters to end costly wars and rebuild our economy. 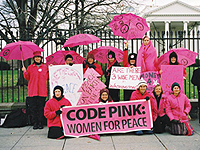 For all of our pink boas and glitter, CODEPINK is deeply serious about creating peace. One of the things we are most proud of is our building of bridges across closed borders. We demonstrate citizen diplomacy by traveling to places most Americans don't go to, like Iran, Afghanistan, Gaza, Waziristan, and Bahrain. It's harder to bomb a place when you know its people's names and faces; when you are aware of their fears and dreams. CODEPINK is a network of creative people, not a hierarchy. Communities all over the country (and world!) create their own local CODEPINK actions, staging creative protests and getting their mayors to agree to Bring Our War $$ Home. Our next big action could be inspired by a local group in a small town... maybe even you! We're not just about ending war; we are working to change our national policy to prioritize life-affirming activities such as healthcare, education, and green jobs, over runaway military spending. We've joined in struggles for climate justice, immigration reform, women's reproductive rights, and civil liberties, to name a few. Recognizing the link between war and violence against women, we will be joining Eve Ensler's Billion Women Rise day of creative actions to end violence on women on February 14, 2013. Whether we're dressing up like vaginas to protest the Republican war on women, or tossing bras to “bust up” big banks on Wall Street, we find ways to illuminate the darkness with a light and playful touch. This year, we've campaigned to move money out of big banks, delivered medical aid and blankets to war survivors from Afghanistan to Palestine, provided relief for hurricane survivors, and continued to find creative and affirming ways to model the world we want to live in. If a pink slip drops and no one sees it, did it happen? We get our actions out quickly and tell the story behind the work. We are non-stop tweeting (@codepink!) from the frontlines, writing op eds (that get published!) and penning our own books. 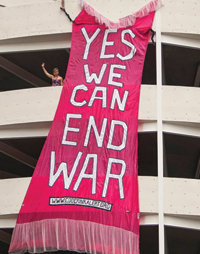 We are eager to continue to write the story of CODEPINK over the next 10 years and beyond. 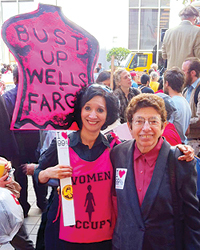 We hope that you will be part of CODEPINK's story as it unfolds.